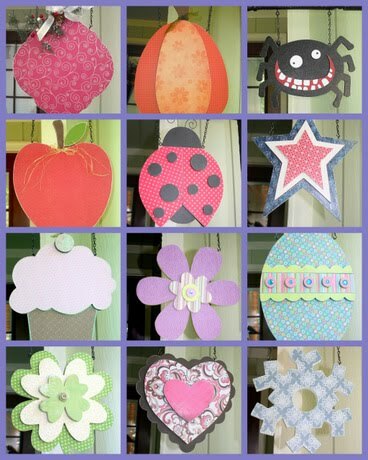 Sweet Pickle Designs: Busy Summer Days! and lately I love any excuse I can find to display little pictures. So when I found this fun font, I knew it was perfect! funny shots of my little girl. I also have wanted to do some EAT letters for my kitchen. but I had so much fun putting them together! These letters I'll be doing a class on in a couple of weeks too! some of the fun ones that have been sent in lately! BTW Thanks ladies for doing this for me! else who peeks on here! Here is a really cute set of Baby letters Cary did up! The picture doesn't do them justice! They are so cute! Here are a couple of Seasonal Hangers I put together. until I saw the huge fingerprint on the lens...courtesy of my little girl. This horse head turned out so fun to me! I love working with fun shapes! I am really excited to see how these letters get decorated! It's a fun new font I found called Ayosmonika. These are 10" letters I key holed to hang across a wall. I just love this font! and I'll post them this week! Thanks again gals for sending me your pictures! Outstanding Nicole! I especially love the fork added to the "E" and the bon appetit is a brilliant touch. You inspire me with your creativity.